10 min. cooking time and 1 ounce of fuel. Using the steam method makes for nice moist good eatin morsels someday I'll have to try the dry/desert bake. 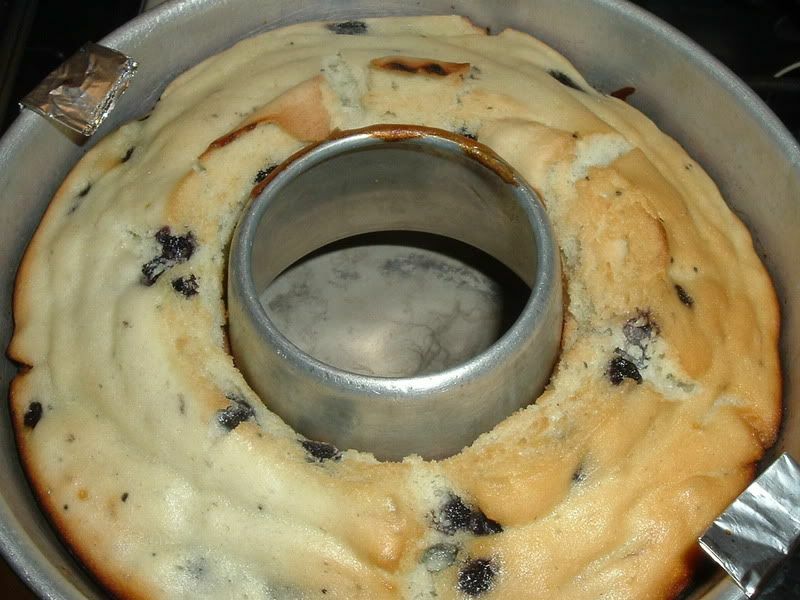 I felt compelled to bump this thread up a notch as a reminder to our viewers alcohol stoves are easy to bake with. The best part is you don't need a stove that simmers. 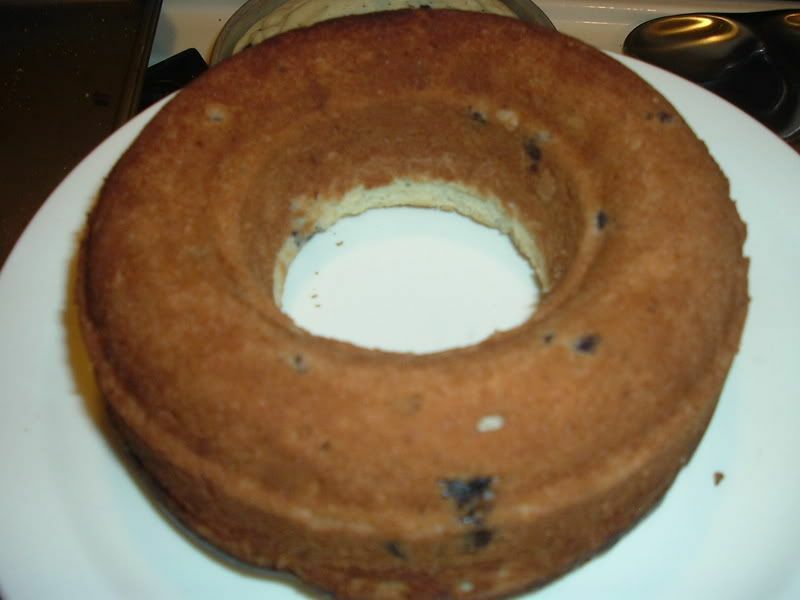 I had a blueberry beagle this morning and made me think of the big blueberry muffins I made with my Fancee Feest alcohol stove and the large jello mold. esterday I wanted to test the mix out of a box. There is at least twice the amount of mix in a box. After mixing the batter I guessed at the total amount of batter to be 1 1/4 cups of batter would be half the amount for each bundt pan that I had greased up. I put the batter into the pans and was ready to bake. 1st one came out fine. 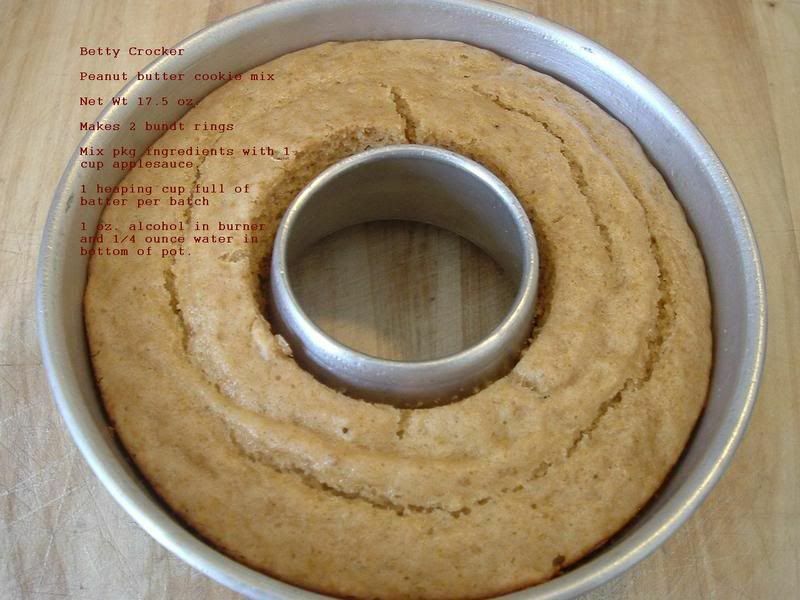 I saw what appeared to be enough water left in the lower pan to do the next bundt pan. I proceeded as normal and half way through the baking I could smell something different. I went to the kitchen and looked to see if the burner was still on. Yep just on the last bit of fuel remaining. After a few min. I removed the lid and was surprised to see the top had browned slightly(see photo). 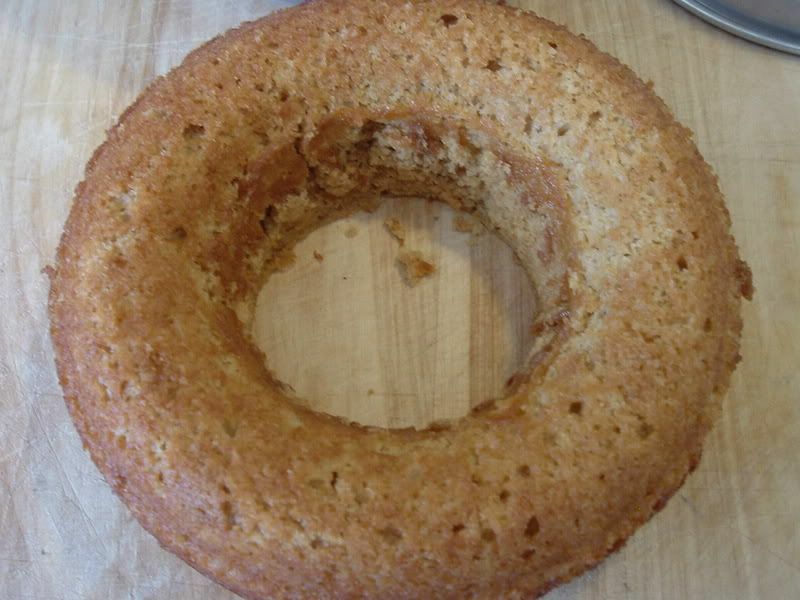 I placed the bundt on a plate upside down and holding onto the two together gave it a quick downward thrust to have the muffin separate itself from the pan. I came out easily and was surprised to see the muffin had browned completely on the outside and inside. The lower pan had run out of water and was being heated while dry causing no harm to the pan but causing the muffin to brown because of the high heat. Now I have to make more muffin rings to determin the right amount of water for the pan to cook and brown on a consistant basis. Things just happen for the better!!!! It was not intentional that it browned. I thought I had enough water left to do another bake. 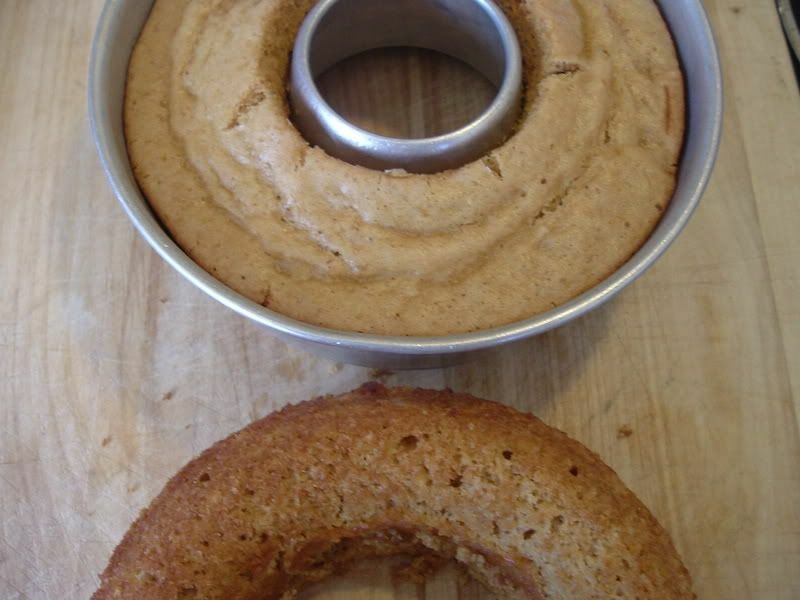 Made 2 Betty Crocker peanut butter bundt ring muffins. 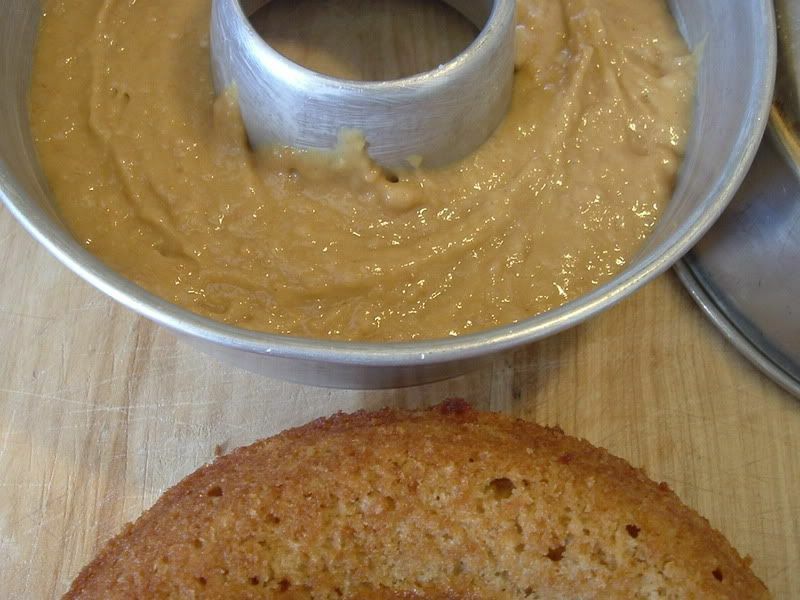 Used Betty Crocker Peanut Butter Cookie Mix. comes in the plastic pouch goo for mixing right in the pouch. I eliminated the required mixing ingredients. I used only 1 cup of applesauce. Wait till cooled before removing from pan. They shrink away from the sides of the pans. My wife made mince meat muffins today and made me think of trail muffin baking. She said there are 2 kinds, the stuff in a jar and the dry in a box. Tis the season for mincemeat goodies. I thought the dried, condensed ingredients would be good to take along to make some good tasting muffins. I did a google and found some info on it. I ordered a 6-pak of the condensed product for the 2014 season. I gathered this info from the "none-such" site. RAISINS, BROWN SUGAR, DRIED APPLES, DEXTROSE, WATER, SALT, BEEF, CORN STARCH, DRIED CITRUS PEEL, APPLE JUICE CONCENTRATE, SPICES, DISTILLED VINEGAR. No raisins on hand? Substitute an equal amount of crumbled Condensed None Such Mincemeat for raisins in cake, cookie or bread recipes. Well today I made a mini cake/muffin. For now it's called the 326 muffin. So I had the idea to use the mix for steam baking and it's working. All I have to do now is refine it using an alcohol stove. Todays test kitchen was performed on the gas stove in the kitchen. Used a stainless steel mug, and aluminum insert and inside the insert was a non stick coated steel angel food cake pan that is 3-5/8" dia. I've seen those pans at wallyworld and Bed bath and Beyond Did u bake it with a an Alky Stove? I got 4 pans on ebay. I'll get link later. they are non-stick, one piece "Fox Run" brand. Heavy, 2-3/8oz made of steel, professional grade. Expensive at some sources. I have not used an alcohol stove yet. Maybe today. I baked it for 6 min same set up. The recipe for the batter is easy peasy. I'll give that later after my testing with the alcohol stove is complete. It' an easy mix to carry in ziploc bags, add the water, knead bag to mix and then pour. I think I'll be using the StarLyte stove for simmering. Not sure what pot yet. 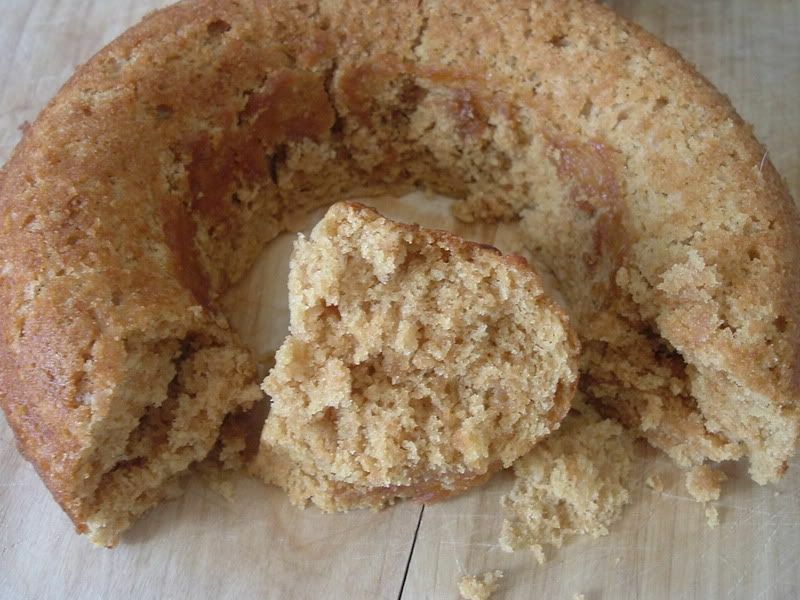 I let the cake cool/rest and then it shrunk away from the side of the cake pan making for easy removal. One of the photos shows that. Seeing the mini cake pan next to the silicone egg poacher, I realize it is smaller than the one I was thinking it was. Ridgerunner wrote: Seeing the mini cake pan next to the silicone egg poacher, I realize it is smaller than the one I was thinking it was. it is on the tiny size. One that is easier to be considered backpacking size. The cake batter has sugar in it so it's a sweet treat after a hearty Mountain House meal. I'm having difficulty matching up the cake pan to a pot with the appropriate lid.